As part of DIY December, I'm featuring holiday decorations and projects all month long. I'll be featuring several Christmas color schemes and today I'm dreaming of a White Christmas. A white Christmas decorating color scheme can be a very elegant look for the holidays and winter. But when using such a neutral color palate, it's very important to incorporate interesting textures so your look isn't a snooze. Soft textures, like a feather wreath, pom-pom wreath, carnation centerpiece, or twine ornament will add warmth to your decor despite white being a "cold" color. These textures will also add some depth to your decor, making the space look more interesting and fun. metallic , or textured glass ornaments which still keep your decor looking snowy white, but will add some elegant contrast. A white Christmas tree is a very pretty and elegant look as well. If you are using a real tree, white ornaments, lights, and ribbons can create a chic and crisp look. 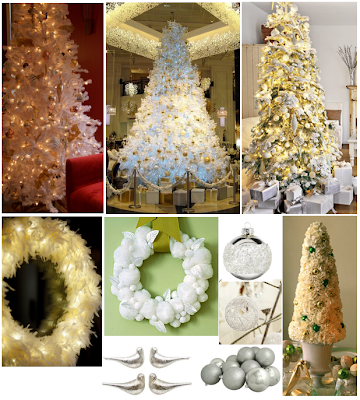 Artificial white Christmas trees can look very elegant too when paired with delicate gold ornaments or placed next a bold color. So what do you think? Does an elegant white Christmas make you want to sing "may your days be merry and bright, and may all your Christmases be white"? Or do you prefer a more colorful Christmas? This is my first year with a white tree. I have a dark chocolate wall in my family room. We set the tree in front of it and decorated with Chocolate brown. I'm smitten! I love the feather wreath- I think it's just what my mantle needs!